Pydio is a PHP based file sharing application maintained by Abstrium SAS, a software company based in Paris, France. Pydio 8 is the latest major version with full support for the PydioSync clients available for desktop (Windows, Mac OS, Linux) and mobile (iOS and Android). Pydio Cells is a next-generation version of Pydio that has been rebased in the Go programming language with a microservices architecture. “Cells” are a brand new concept giving non-administrator users more control over permissions to share Pydio workspaces with their colleagues. New features such as live chat have also been added to further facilitate collaboration. Both Pydio 8 and Pydio Cells come in two editions, a Community edition that is 100% free and open source, and an Enterprise edition that is available exclusively from Abstrium with per-user licensing. For most organizations, we recommend deploying the Community edition of Pydio 8 at this time. Pydio 8 Community allows unlimited users with no licensing costs. Pydio is trusted by academic and commercial organizations worldwide for enterprise file sharing & sync, including Erasmus+, Seagate, Nikon, University of Cambridge, and Washington State University. Compared to subscription cloud storage providers such as Dropbox, Google Drive, and Microsoft OneDrive, a self-hosted platform such as Pydio provides the flexibility of storing your files on-premises or in the datacenters of your choice. 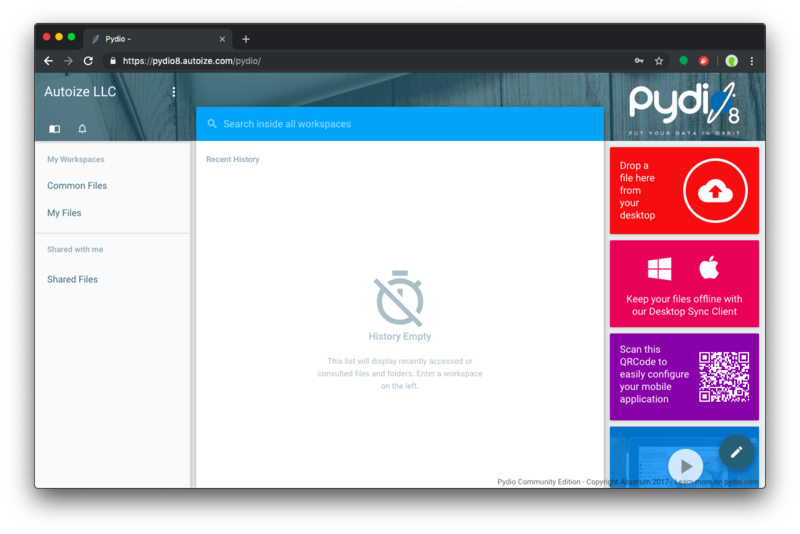 Managing Pydio as an administrator is easy, with a graphical dashboard for adding and revoking user access at any time. Storing data in an EU/EEA based datacenter can simplify your organization’s compliance with GDPR by avoiding the transfer of data subjects’ data to third-countries. As your needs grow, you can increase the size of the block storage volumes attached to your Pydio instance, making Pydio an incredibly scalable solution. Say goodbye to arbitrary tiers and paying for more space than you need for each user. Usually the limiting factor is the number of users, not the storage quota as the average user uses a small fraction of their allotted storage capacity. With Pydio or our other self-hosted cloud storage solutions, NextCloud or Seafile, you only pay for the hardware you provision — helping keep costs down.